END OF STORY ARC "THEM BLUE WIZARD BLUES," Conclusion The fourth arc of the acclaimed series comes to a close, with the game-changing revelations you've come to expect from CURSE WORDS. 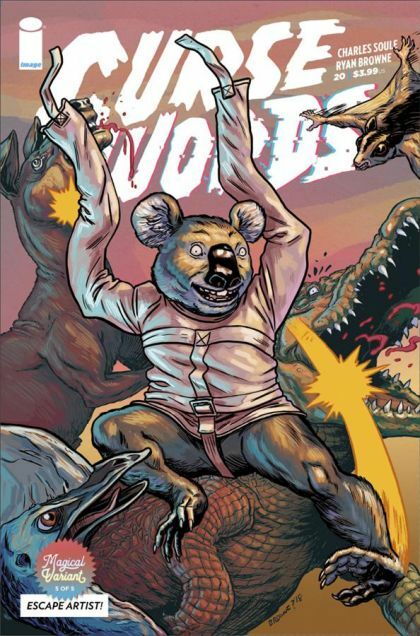 IN THIS ISSUE: a talking koala makes a proposition, a bunch of bad guys get drunk and make a fateful decision, and Wizord loses a fight. Like, badly. Offered with our final "magical" variant by RYAN BROWNE: a fun reference to a classic stage magic trick of old. Get it!